When you are finished creating your campaign, and the email has been written, and the contacts have been selected, you will want to test and launch your email campaign. Before launching the campaign, you should test to ensure it looks all right. 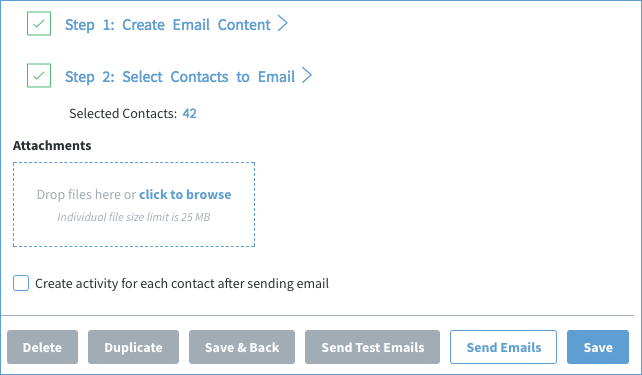 The Send Test Emails button chooses the first five contacts in your list and generates emails for them, but does not send them to the contacts. The test emails are sent to the assigned user's email address, so that user can see the mail merge function in action (the Preview option does not show mail merge data). Once you feel you are prepared, you can start your email campaign. The Send Emails button launches your campaign and sends the email to the intended recipients. The emails are sent to your server in batches in a queue. Therefore, a large email list may take longer to send. Once you click Send Emails, the send process cannot be paused or stopped without closing the browser tab or disconnecting from the internet. If the send process is interrupted, Method will automatically start sending the emails once the process is resumed. Method remembers how many emails were sent before the interruption (e.g. 250 of 500 emails sent) and will resume the process at the same point (e.g. at email 251). When you click Send Emails, you are prompted with an "Are you sure" message. Click OK to continue. You must leave the browser tab open until the send is complete, or the send process will be interrupted. 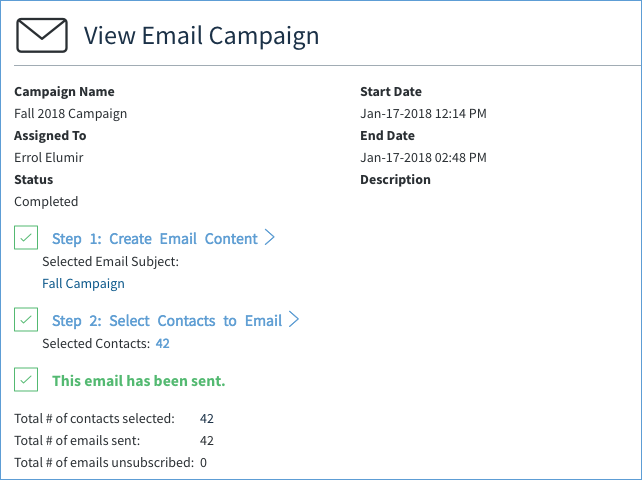 Once the send is complete, you are returned to the Email Campaign screen but in View mode. You will no longer be able to edit it, considering it is already sent. Confirmation that your email was sent. Total number of contacts you selected to send the email to. Total number of emails sent (you will be notified if not all of the emails were sent successfully). Total number of contacts who clicked unsubscribe on this email (this number continually updates as long as this campaign is saved in Method). The last point is a particularly powerful feature because it provides valuable insight about the success of your campaign. By looking at the number of contacts who unsubscribed after receiving this email, you can evaluate the effectiveness of your messaging, which can help improve future campaigns. This number consistently updates over time. Best of all, as long as you save this campaign in Method, this information will always be available to you. And that's it! You've successfully completed your email campaign with Method's Email Campaigns App. Congratulations!